Finally, the time has come! As Bob Iger has once said, "Let the memories begin!" I'm sure there are so many details being lost in the photo translation - I am so excited to take it all in on our next visit!! I think everything looks so great but there is something that has been bugging me forever and its Beasts Castle. I just keep telling myself that it doesn't look right because its not all open yet, but each time we inch a little closer and closer to it, its still not working for me. I don't know what it is. I think its the fact that it doesn't look like real brick on the castle. Everything around it looks so realistic, but then you have this miniature castle that just doesn't look real enough to fit in with its surroundings. Im sure Im the only one and I've seen the castle in person on a weekly basis but it just won't fall into place for me. Great news! I completely ignored the Spoiler Alert message because I'm just so pumped! Thanks for the pics! It all looks so beautiful! I have to agree with @djkidkaz though a bit that for some reason Beast's Castle just doesn't seem right. I dunno if it's the colors or what but now seeing it from where it's meant to be seen, it almost seems out of place or themed wrong. Odd. I still love it and the overall impact of the area though. I cannot wait to see it in person! it almost seems out of place or themed wrong. area though. I cannot wait to see it in person! I agree, it does look a little weird. Maybe it's just to small for me. But then again, I like big things. I wish they'll put a ride in it one day. That'd be AWESOME! 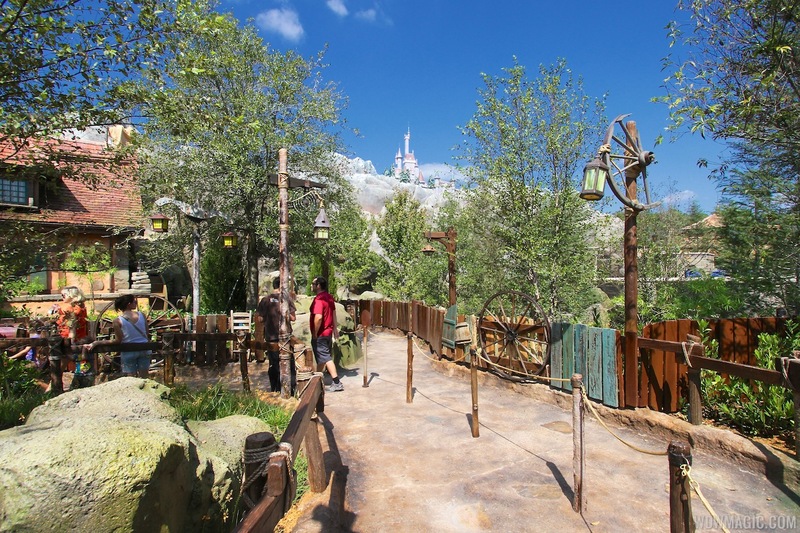 Put a trail that leads underground to behind the service road and tree line that eventually comes to ground level and voila you're at 'Tale As Old As Time: Belle's Journey"! Great idea! Man, WDI needs to hear your ideas . That is my dream job, but I feel like they would hold budgets too short or wouldn't approve past Blue Sky. But if I do make it there, and these ideas come to fruition, you can say you discussed them with the creator. Yeah, WDI's problem is not lack of good ideas, it's the lack of freedom/budget to implement them. Just go for it! Follow your dream! I think the castle believability all depends on the angle and lighting. From some areas it really works, others not so well. At the end of the day, it is still a 40ft castle. I think you're probably right. In that picture you posted above, I think it looks fantastic but there is still this odd thing I can't quite put my finger on. I think it's the colors. I think it's the almost pastel feeling of the rock work and the castle paint against the rich warm colors of Belle's Village. Don't get me wrong, I think it looks incredible, I just can't get past that there is a separation of theme. Maybe in person it's not as obvious when you're walking around taking it all in but from the photos it does bug me a little. One issue is that in some photos it is viewed with a zoom lens, where the entire thing is filling the photo. It is really a model, and is not meant to be viewed like that, it is supposed to be viewed from ground level. Yeah, it's probably that this is zoom lens. I hope to see it better for myself, though. True... but to be very honest, until these photos, I didn't really notice it as much. Essentially it was once I saw it from ground level, with the village surroundings, that it started to bug me. I think I'm just in a mood to be picky though as I am also nit picking Gaston's costume in another thread and posted my first thread to simply vent. It must be that kind of day. LOL!